South Korea is a key US ally and hosts 28,500 US troops but many of Trump's critics in the South see him as a warmonger. The Donald isn’t welcome in South Korea. That's the message thousands of protesters sought to pass on Sunday ahead of an upcoming visit by the American President. The protesters believe Trump’s war of words with the 'Rocket man', Kim Jong-Un of North Korea has made them unsafe. They are therefore asking him to stay away from their country as they don’t think he represents peace. The US President is to begin his Asian tour on Sunday. He arrived in Tokyo on Sunday and is set to visit the South from Tuesday to Wednesday as part of his first Asian trip as head of state. He is also expected to visit Vietnam, China and the Philippines. He is scheduled to hold a summit with President Moon Jae-In of South Korea and visit a US military base, with all eyes on his message to the North and its leader Kim Jong-Un. South Korea is a key US ally and hosts 28,500 US troops but many of Trump's critics in the South see him as a warmonger whose recent war of words with Kim has heightened tensions in the region. "We oppose war! Negotiate peace!" 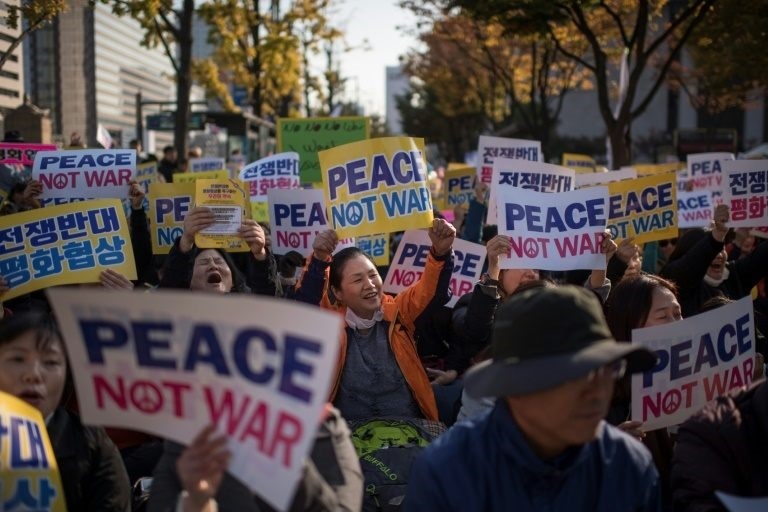 the protesters chanted in central Seoul, waving banners and balloons emblazoned "Peace, not war" and "We want peace".